Searching for an Ibizan Hound? The Ibizan Hound originated in one of the Balearic Islands called Ibiza (Eivissa), an island off the coast of Spain. Bred as a sighthound to hunt rabbits and other small game, this dog breed is lithe, athletic and tall, standing 56 to 74 centimetres and weighing 45 to 50 pounds. Kind, intelligent and calm, Ibizan Hounds have become attractive companion dogs. However, their lack of street smarts makes them poor guard dogs and watchdogs. Are you ready to take home an Ibizan Hound? Read on to know more about this noble and eager scenthound hunter. As the name suggests, the Ibizan Hound originated in the Island of Ibiza, one of the Balearic Islands off the Mediterranean coast of Spain. It is a highly-prized scenthound breed used to hunt rabbits and other small game. 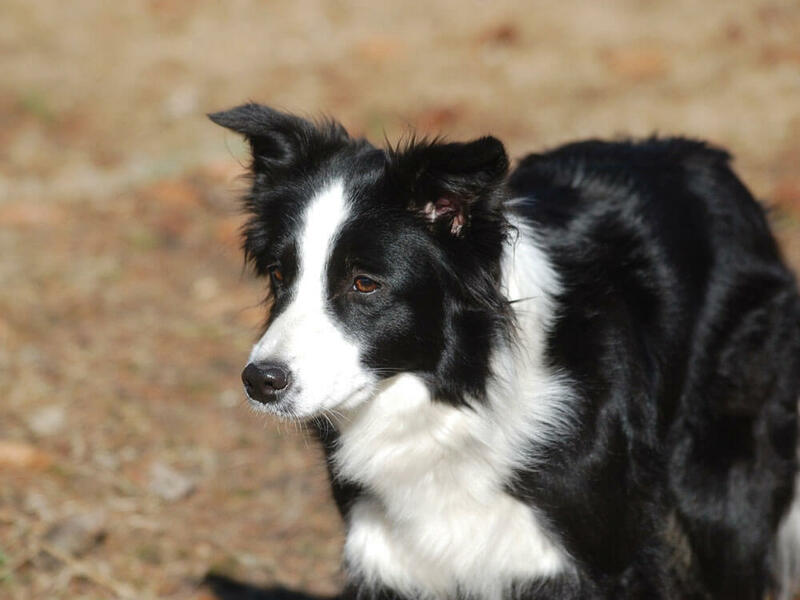 It is a lithe and fast dog that can hunt on different types of terrain. Records suggest that the breed's ancestry can be traced back to 3400 B.C in ancient Egypt. It is said that royal dogs resembling the Ibizan Hound are found in many artefacts in tombs of pharaohs such as the Hemako of the 1st Dynasty, Nevermat of the 4th Dynasty and Tutankhamen of the 18th Dynasty. However, this was refuted by genetic research showing that the modern-day Ibizan Hound, and its cousin the Pharaoh Hound, are new reconstructions of an older type which lineage did not go back thousand years ago. Mysterious ancestry aside, it was the Phoenicians, well-travelled traders, who may have brought dogs from Egypt to Ibiza in the 8th or 9th century B.C. when they came to settle. In the 1950s, a Spanish dog breeder and show judge living a short distance from Ibiza took an interest in the breed and started a controlled breeding programme. From then the dog breed was actively promoted as Ibizan Hounds all throughout Europe. The American Kennel Club first recognised the Ibizan Hound in 1979. Its first appearance at a dog show is in 1980 at the Westminster Kennel Club. Today, the Ibizan Hound remains a rare breed. The Ibizan Hound is described as having a deer-like or Greyhound-type body, which is elegant, lithe, athletic and tall. It stands 56 to 74 centimetres and weighs 45 to 50 pounds. It has a magnificent bearing of an ancient noble dog with its long arched neck leading into a long wedge-shaped head. Its large triangular ears stand when it is alert or excited while between the ears is a white mark referred to as the "axe mark," which is characteristic of the breed. The eyes are small and reflect the colours of caramel or amber. Nose is flesh-coloured or pink, which stands out beyond the jaw and is convex in shape. Its tail hangs naturally low or carried high when it is alert. Its body is compact with a tucked abdomen. Ibizans come in two types of coats, shorthaired and wirehaired. The coat can be red or white or a combination of the two colours. 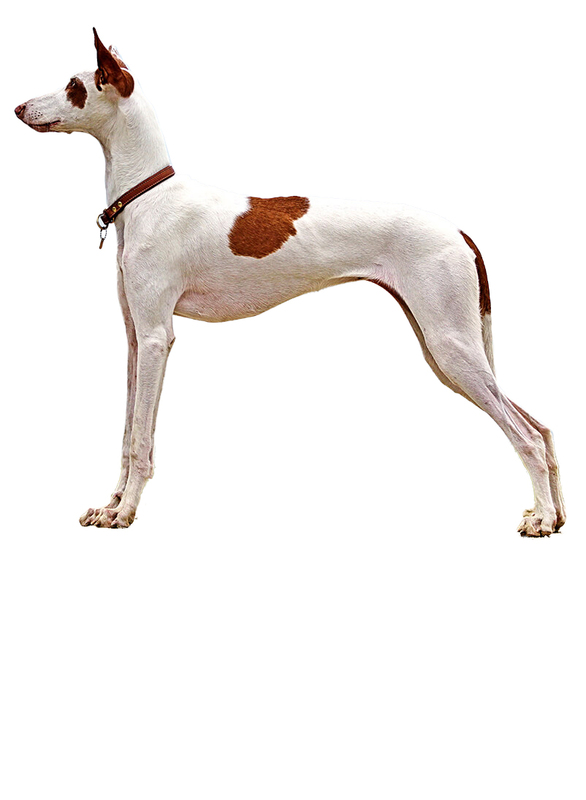 The most common Ibizan Hounds have a white base with red patches. Because of the Ibizan's tight, smooth and short coat, it is low maintenance on the grooming front. With this said, a weekly brushing will suffice to make sure its coat remains tidy, and skin maintains its good condition. However, the wirehaired Ibizan requires a bit more work as it needs occasional combing, with dead hairs hand stripped a couple of times a year. Ibizan Hounds also shed throughout the year and more so during autumn and spring. This will require frequent brushing. Aside from coat care, make sure to check your Ibizan for any lumps or injuries. Also, remember that this dog breed sports a single coat, which means it can feel the cold and quickly catch chills compared to breeds with double coats. Don't forget to also check and clean its ears on a regular basis to avoid infections. Trim its nails to prevent painful overgrowth and cracking or splitting. Also, brush its teeth to remove tartar and keep bad breath and gum diseases at bay. The Ibizan Hound has a mixed temperament of a noble and wild hunter breed. Indoors it desires to be pampered and is usually quiet around the house, while outdoors it is lively and will chase anything that moves, which it considers as prey. Its trademark ears are super sensitive and will twitch when it senses someone coming. Although it does not bark to alert, one look at the ears will tell you. Regardless, this dog breed is not an ideal watchdog or guard dog. With its family, the Ibizan is calm, affectionate, and loyal. Ibizans are true clownish dogs, delighting in making their family happy with their harmless antics. However, it is reserved and aloof around strangers but never shy or aggressive. Since it is an intelligent, independent dog and a people-pleaser, the Ibizan Hound is fairly easy to train. However, it may be stubborn at times, so positive reinforcements in the form of treats and snacks will help get it back on track. Ibizan Hounds are known to be gentle, calm and fun-loving dogs that thrive in a family environment. Therefore, they are also great with children. With this said, children must be taught how to handle an Ibizan Hound especially since this dog breed is sensitive by nature. Of course, it also follows that any interaction between the Ibizan and the children must be supervised to make sure playtime does not cause accidents. When it comes to other household pets, the Ibizan Hound is known to be good around other dogs and will rarely show any aggressiveness. However, since the Ibizan is a scenthound, smaller animals may seem like fair game, which may lead to a catastrophic result. A typical serving for an adult Ibizan Hound is 2 to 3 cups of high-quality dog food per day. Servings must be divided into two equal meals to prevent bloating. However, the amount and type of food to serve will depend on many factors such as the dog's age, size, gender, health, activity level and metabolism. It is highly recommended that you take your dog for a veterinary consultation to determine a balanced and nutritious diet tailored to your dog's needs. To ensure that your Ibizan is provided with its nutritional needs, select a high-quality and vet-recommended dog food brand that is specially formulated for the Ibizan's size. Animal protein is essential for muscle growth and must be the top ingredient in its diet. Examples of protein sources include chicken, lamb or beef. When properly cared for, the Ibizan Hound can live up to 14 years. However, it is inevitable that it will inherit a few genetic health disorders common to its breed. These health disorders include Seizures, Allergies, Axonal Dystrophy, Cataracts, Deafness and Retinal Dysplasia. At this point, owners should be aware of the signs and symptoms of these disorders by consulting with a veterinarian for preventive measures. In addition to preventive measures, Ibizan Hounds must meet its activity requirement to ensure its overall health and happiness. Ibizans need to engage in rigorous activities such as running or sprinting, hiking, jogging, and galloping across a spacious enclosure with high fences. Why high fences? The Ibizan is known to be an excellent jumper, so only a 6-foot high fence will keep it from escaping. However, you should not worry if you live in the city. Ibizans are city dwellers as long as they are given at least 2 hours to sprint or exercise. Small apartments are not an option because of its size. You can adopt an Ibizan puppy, which will save you money but if you want to buy a well-bred pedigree puppy from a reputable breeder, prepare to pay £300 to £500. Pet insurance will help you offset costs in the emergency health situations or accidents. Most pet insurance will calculate the premium based on your location, the dog's age and its current health. For a 3-year old Ibizan Hound, costs will likely be between £20 to £40 a month. Buying high-quality dog food for your Ibizan puppy until its adulthood will cost around £40 to £50 a month. This does not include treats especially when it undergoes training. Veterinary costs are another financial setback you must consider. Regular veterinary health checks and some basic procedures will cost no less than £1,000 a year. As a rough estimate, the average cost you must be able to commit to caring for an Ibizan Hound will be between £70 to £100 a month. Is an Ibizan Hound Right for You? The Ibizan Hound is both noble and wild in temperament. It is quiet inside the house but lively and active outdoors. It tends to want to be pampered like the noble dog it is and will reward you with its clownish personality. Its prey drive is strong. It may get on well with other medium-large dogs but will chase smaller animals including small dogs. It does not bark much. Instead, it twitches its ears to let you know if someone is coming. Ibizan Hounds come in two coat types: wirehaired and shorthaired. Both are low maintenance. The Ibizan Hound has a lifespan of 12 to 14 years, which also means it will cost you quite a bit to raise to its full maturity.